Thwarted by the early summer we are having in London, I stayed out too long and missed the only thing worth watching this week on TV. It was an investigation into India’s rise as a superpower and economic miracle on the one hand, while being mired in poverty on the other. It was aired on the same day The Sunday Times reported Calcutta-born Lakshmi Mittal as the fastest growing fortune in Britain with an average annual growth rate of £621million. And the day other media reported that ethnic minorities are twice as likely to live in poverty than white Britons, with some 30% of Indians in Britain living below the poverty line. Britain’s interest in India doesn’t end in questionable economic miracles and Z-list Bollywood stars, we have the many curry houses to think about too. It’s been a while since I had a rant about the sludge passed off as Indian food in this country. Parsi Lamb Dhansak is a case in point. It’s a flavourful, healthy and delicious curry contributed to our cuisine by Parsis, which British curry houses have bastardised beyond belief with the addition of pineapple, spinach and other dubious ingredients. Normally, a dhansak is a weekend project with a long list of ingredients. But a pressure cooker or slow cooker, and a store bought pack of Dhansak Masala can come in handy. It also has much merit as a hearty weekday meal with vegetarian potential. My suggestion would be to cook this as a one-pot stew and eat it with Parsi Brown Rice. Oh and don’t get put off by the long list of ingredients – think how much fun it’ll be telling your local curry house where to dump their dhansak. Wash the lentils with cold water until the water runs clear. Leave to soak covered with fresh water. In a frying pan, dry roast the spices on a medium heat for 20 seconds. Then grind into a paste with the ginger and garlic using a tablespoon or two of water. Coat the meat pieces in this marinade and leave to sit. Next, bring the oil to heat on high and when it’s hot and sizzles when touched with a wooden spoon, saute the chopped onions. In 10 minutes, when the onion is golden, drop in the lamb along with its marinade and saute for another 10 minutes until brown all over. Now mix in the tomatoes, and as they melt away, spoon in the lentils and the other ingredients for the lentil mixture. Pour water in to cover, bring to the boil and cook on a gentle medium heat for another hour to hour and a half until the lamb is literally falling off the bone. You could use a pressure cooker or a slow cooker to do this for you. Go into the pot and mash the lentils up so you get a smooth mixture towards the end of cooking time. Finish by stirring the tamarind paste, check for salt and add more if you prefer. 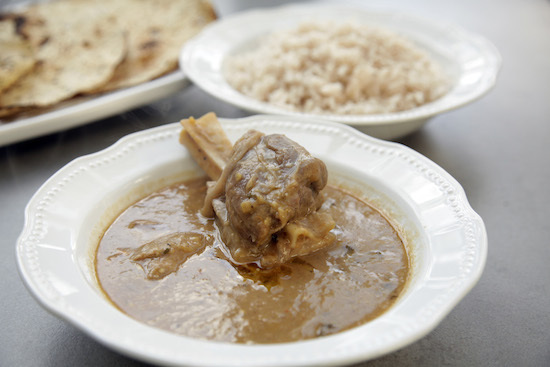 Serve Parsi Lamb Dhansak hot with ghee dropped on top. Great post, Mallika. I’ve had the privilege of seeing dhansak made properly when doing my work experience with Cyrus Todiwala at CafÃ© Spice in Aldgate. Not surprising that he makes it so well (and has strong views about some bastardised dhansak recipes) because he’s a Parsee. the photograph of your recipe was so wonderful that I could not resist, but had to do it. However mine did not turn as saucy as yours. It became rather a paste. Besides, it was not sweet and the cumin taste was too strong. I would therefore appreciate if you could explain me a few things. 1) How much water do you put on the pressure cooker with the lentil mixture? 2) How much water do you put on the paste to mix it? 3) how much ginger is added? You wrote 1 glove, but there is no such thing as a glove of ginger. Besides some ginger roots are bigger and other smaller. 4) How big is the pumpkin. How much should it weight? 5) Are these table spoons full like a mountain, or at the level of the spoon? 5) Is this tablespoon of cumin and coriander in powder or fresh ones? 6) what does this kasoori methi taste like? I am asking you because where I live there are no Indians and therefore I do not find this ingredient. 7) although you said the salt is to taste, how much approximately do you use? One teaspoon salt, more, or less? I am so sorry that your dhansak didn’t come out as saucy as mine (no pun intended!!). I can see that the recipe has some holes in it that I can surely rectify now. Great post! You are spot on with the entire recipe and have got the proportions absolutely right. Being a working chef, who has had the childhood advantage of great Parsi tenants & wonderful Parsi Friends in Secunderabad where I grew up, I am sure that this recipe is foolproof and comes very close to what I do here at work. This can be tried with chicken as well as long as one takes care to saute the chicken separately and then add it to the finished dhansak. It was just today that I entered you page and saw your answer to my questions. Many thanks to your kind and detailed answer. Please, do not worry about me possibly going off Indian cooking because of my faulty cooking. I do appreciate Indian dishes (though I have a problem with hot ones) and I would surely insist on trying even the lamb dhansak in an Indian restaurant shall my next try does not come out as saucy as yours. I do not think I will be cooking it in the very near future, but when I do, I shall let you know about the result! nice to see a traditional un-bastardised version of this classic tasty dish. I take it I could produce a similiar effort without a pressure cooker? I have an old Mrs Balbir Singh cookbook from the 70’s and she advocates the use of pressure cookers, should I get one? Thanks for writing in. I’m on hols at the moment hence the late reply – sorry! Everything on my blog is un-bastardised because I got so sick and tired of seeing the crap being churned out at Indian food. I would 100% recommend a pressure cooker. It’s economical, energy and time saving. This is one relic from the 70s that needs to come back in fashion. They are also piss easy to use (excuse the language). More from me later… whoever is Mrs Balbir?? I was very excited to find this recipe! I’m making it tonight for dinner but as I don’t have a pressure cooker, I thought I would make the lentil sauce mix last night and did have a little stab in the dark when guessing the right amount of water to use and it did stick a little but I topped it up and now have what looks like a lentil soup consistency. I also made the paste last night ind it smelled terriffic! Yes, the ingredients list is a little long but for we who tend to cook a lot of Indian, it shouldn’t prove too expensive as the spices, herbs and major flavour ingredients are already in our larders. I only had to buy the lamb, aubergine and pumpkin (butternut squash, actually) Wish me luck and I’ll let you know how it turns out! OK! I made this recipe last night and Have to say that overall it was a success but with a few alterations. I tasted it along the way and felt that there was still a little something missing. 20 minutes before serving I added another 4 chopped cloves of garlic, another chilli and the twice the amount of required tamarind paste. Right before serving I squeezed in the juice of half a lemon. There was a lot of sauce and I ended up using 700g of lamb shoulder so that might be why the flavours seemed a little insipid to me at the beginning. I hope the addition of lemon juice didn’t completely ‘bastardize’ the recipe but it really seemed to give it that little something and this curry was one of the best I have ever made. I would be interested in doing a prawn version, as my step-mother loves prawn dhansak but I don’t know whether that would be authentic or when I would add the prawns to avoid over-cooking. Thanks so much for writing in. I think your dish tasted a bit bland at first possibly because you used more lamb. But then, it could also be the quality of the spices. They vary sooo much. It’s hard t keep up sometimes!! My dish did have a lot of sauce and I liked it like that. I am sure the lemon juice was a lovely touch. Hope you are going to try some other recipes too. I,m gonna give this a go tonight, but I,d like to see a printable version of the recipe available please. The paste seems a little light on Cumin & Coriander of teaspoonsful are used. What is a “cup” of ingredient can we please have grammes or pounds/ounces for the rest of the world outside the USA? Oops! “of” = “if” in para2. plural “s” and ? after what is a cup………..
Roger – Please try the recipe first and then we can discuss your thoughts on tsp or tbsp cumin/coriander. This recipe has so many wonderful flavours that you don’t want to overpower it. Also, all my recipes are in gms. A cup refers to the average tea mug. You are obviously new to my blog, as most of my recipes are in gms with a converter for those in the US. Hi, just wanted to say – I cook a lot of Indian food, but have never made dhansak as I could never get pumpkin! Your suggestion of the squash / sweet potato worked great! Anyway, I would like to say that this recipe is brilliant!! Loved it very much – as did all the guests I had round to eat it!! I cooked this tonight and it was delicious. I’ve been cooking Indian food for years but have cooked “traditional” dhansaks only a few times from various recipes. None were as successful as this one. Many thanks. I’m always on the look out for authentic flavours, techniques etc. Are there any really good authentic (i.e. home cooking style) cookbooks you’d recommend. I have Madhur Jaffrey’s books which I value but a whole host of other supposedly Indian cookbooks that I don’t! Your Methi Murgh also looks excellent. I’m a real sucker for methi! Its even sold ready crushed for those that find it a chore to crush it themselves. I want to try cooking your Lamb Dhansak recipe in my WMF pressure cooker, but I don’t know how much water should I put in the cooker together with the lamb & lentils. If you find, as I do, that sweet potato is a chore to peel & chop, microwave it until it softens then bake briefly in a hot oven. Slice just through the skin around the middle. The skin will then twist off the flesh, often cleanly enough that is doesn’t break or leave any flesh behind. Even if it does, you can easily scrape it out with a spoon. As a bonus, you’re left with the skin to crisp up in the oven and eat. Not sure if you’re still around to see these, but this recipe looks fantastic, I can’t wait to try it. I have to go get myself a pressure cooker though. My parents had some Indian friends when I was growing up who moved back to India, and my biggest memory of their house was the whistle of the pressure cooker along with the smell of the curries! Ijust have to say that this is an AMAZING recipe! Dhansak is my favourite curry and this is absolutely, ridiculously delicious and one I will be making again and again! Thank you so much for this recipe, it rather difficult to find a dansak recipe without the dreaded pineapple. Made it for a dinner party and was an enormous success. Thanks for the great recipe Mallika! I’ve been trying to recreate the amazing hot and sour flavours of a Dhansak at home for years and this recipe absolutely beats all of my previous attempts. Like one of the posts above, I think a tiny bit of lemon juice right at the end is the only thing I changed. Thanks again and ‘Keep on cooking’! quick question– I want to make this tomorrow! are the red chiles dried or fresh?? Hi there. How could you adapt this recipe for a slow cooker? It looks wonderful, but I don’t have a pressure cooker. Many thanks.